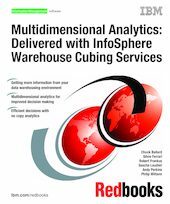 In this IBM Redbooks publication, we discuss and describe a multidimensional data warehousing infrastructure that can enable solutions for complex problems in an efficient and effective manner. The focus of this infrastructure is the InfoSphere Warehouse Cubing Services Feature. With this feature, DB2 becomes the data store for large volumes of data that you can use to perform multidimensional analysis, which enables viewing complex problems from multiple perspectives, which provides more information for management business decision making. This feature supports analytic tool interfaces from powerful data analysis tools, such as Cognos 8 BI, Microsoft Excel, and Alphablox. This is a significant capability that supports and enhances the analytics that clients use as they work to resolve problems with an ever growing scope, dimension, and complexity. Analyzing problems by performing more detailed queries on the data and viewing the results from multiple perspectives yields significantly more information and insight. Building multidimensional cubes based on underlying DB2 relational tables, without having to move or replicate the data, enables significantly more powerful data analysis with less work and leads to faster problem resolution with the capability for more informed management decision making. This capability is known as No Copy Analytics and is made possible with InfoSphere Warehouse Cubing Services.